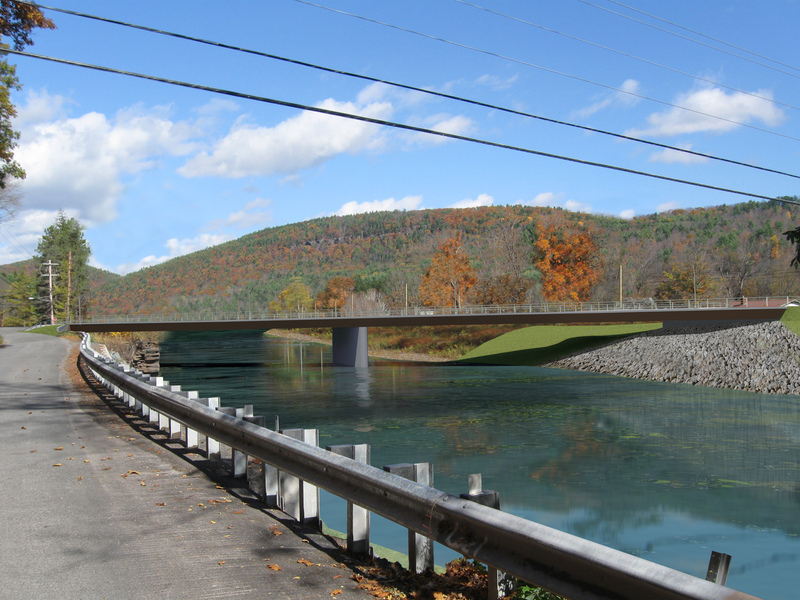 Governor Andrew M. Cuomo today announced that work is underway on a $13 million project to replace the Prattsville Bridge carrying Route 23 over the Schoharie Creek in Greene County. The project is part of the Governor's $542 million Empire Bridge Program, a key piece of New York's commitment to rebuilding critical infrastructure. "Across New York, we are rebuilding our vital infrastructure to ensure our roads and bridges are safer, more resilient, and able to help foster future growth," Governor Cuomo said. "This bridge replacement in an area that felt the wrath of Hurricane Irene will help ensure this key roadway will remain in good repair for years to come and be able to withstand what Mother Nature is able to throw our way." The Prattsville Bridge over the Schoharie Creek, which was built in 1927, was damaged by Hurricane Irene in 2011 and closed for four days for unrelated steel repairs in 2012. The new bridge will be built adjacent and downstream of the existing bridge and approximately 4.5 feet higher. It will allow for a wider opening underneath the bridge, which will provide for greater water capacity to prevent future flooding. The new bridge will have wider shoulders and will include a sidewalk. Some initial work on the bridge may begin later this summer, with most of the work expected to occur in 2018 and be completed in 2019. The Prattsville Bridge project also includes the replacement of the smaller Route 23 bridge over the Huntersfield Creek and the replacement of two culverts on Route 23 near Greene County Route 2. As part of a larger $17 million infrastructure project underway in the region, an additional $4.1 million investment will replace the Route 42 bridge over the West Kill in the town of Lexington and the Route 296 bridge over the East Kill in the town of Jewett. Temporary traffic signals are expected to be installed this month to accommodate traffic during the project to replace the Route 23 bridge over the Huntersfield Creek near the Prattsville Diner. Work on the Huntersfield Creek bridge is scheduled to be completed by the end of this year. In Lexington, signage has been installed and trees have been removed so that a temporary bridge can be built to carry Route 42 over the West Kill. Construction of temporary bridge approaches has started. The temporary bridge itself is expected to be in place in June and will be used in conjunction with traffic signals to carry alternating lanes of traffic. The existing Route 42 bridge will be demolished and a new one built in its place, with the new bridge scheduled to be open by the end of this year. In 2018, work will begin on the replacement of the Route 296 bridge over the East Kill in Jewett. A temporary bridge will be built to carry traffic during construction, with a new Route 296 bridge scheduled to be open by the end of 2018. Work to replace the two culverts on Route 23 near County Route 2 is also expected to begin this month, with traffic controlled by temporary signals. Consistent with Governor Cuomo's Driver's First initiative, the project has been designed to minimize impacts to expressway traffic. New York State Department of Transportation Commissioner Matthew J. Driscoll said, "Governor Cuomo understands the link between a strong economy and strong infrastructure, and by committing to these bridge replacements, we are helping to ensure that residents and visitors to Greene County have a reliable and safe transportation network to better withstand extreme weather." Senator George Amedore said, "Many areas of Greene County, including Prattsville, were devastated by Irene and this investment is part of ongoing efforts to rebuild the community and upgrade our infrastructure throughout the County." Assemblyman Peter Lopez said, "This is an important and very personal announcement for my office and the people of Greene County. Governor Cuomo and his team continue to demonstrate their commitment to making our homes and families whole again. I stand united with him on these and other important efforts to strengthen our communities against future storm events." Greene County Legislature Chairman Kevin Lewis said, "I would like to thank the Governor and NYS DOT for their continued support of the Town of Prattsville after the hurricane. The new bridge will be a great asset to the town of Prattsville and the entrance to Greene County. A wider opening between the bridge abutments will help high water conditions flow through and prevent backup in the town. Again, thank you to Governor Cuomo for your investment in the infrastructure throughout New York State and particularly in Greene County. We look forward to these projects and many more." Prattsville Town Supervisor Kory O’Hara said, "These projects illustrate how Governor Cuomo has kept his promise since day one of Hurricane Irene by building our communities back bigger and stronger; this has been his top priority. Prattsville applauds the Governor and Commissioner Driscoll on these bridge projects." Lexington Town Supervisor John Berger said, "Lexington is glad to see the state’s investment in our local infrastructure. We recognize that these bridges and roadways are essential to the safety and accessibility of our local residents, second homeowners, and the tourist visiting our mountaintop communities." The Empire Bridge program, administered by the New York State Department of Transportation, is replacing 100 aging structures across the state. The new bridges will be more resilient and better able to withstand flooding. Completion of the Empire Bridge program will afford residents of communities across the state stronger and more resilient bridges, and reduce the potential for highway travel delays and detours during heavy rains and floods. It will ensure continued access to critical lifesaving services in the event of an emergency. Motorists must use caution when traveling through the work zone and are reminded that fines are doubled for speeding in a work zone. In accordance with the Work Zone Safety Act of 2005, convictions of two or more speeding violations in a work zone could result in the suspension of an individual’s driver's license.